Some of Nigeria’s finest celebrities, Richard Mofe-Damijo, BasketMouth, Uti Nwachukwu and Kemi Adetiba will join international top shots to the party capital of the USA, Las Vegas for the first ever selfie from space, courtesy of the world’s number one brewer, Heineken. Billed to take place on November 5, 2015 in Nevada, Los Angeles, these celebrities will join other big names including popular Bond Villain, Dave Bautista to experience the first of its kind selfie from space as well as many other exciting activities lined up in preparation for the James Bond “Spectre” premiere. In partnership with Urthecast, Heineken® will create the selfie experience from space using a camera on the Deimos satellite, currently in orbit 600km above the Earth’s surface to take ultra HD imagery of the lucky celebrities including the Nigerian quartet assembled at the Hoover Dam in Las Vegas. The Heineken Spyfie is one of the activities in the brand’s integrated global “Spectre” campaign, which centers around the latest installment in the James Bond film series titled ‘Spectre’. The campaign also features an exciting TV ad featuring Daniel Craig as James Bond in a high-speed boat chase. 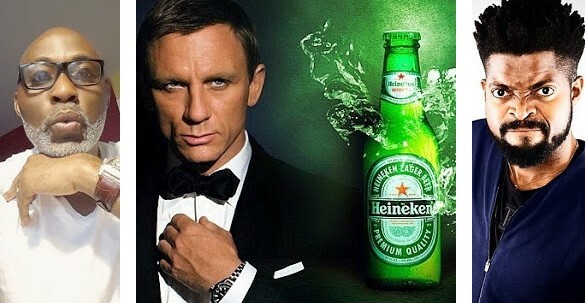 Beginning with 1997’s ‘Tomorrow Never Dies’, Heineken® has partnered with James Bond since 1997 and Spectre is the seventh consecutive film in the partnership.